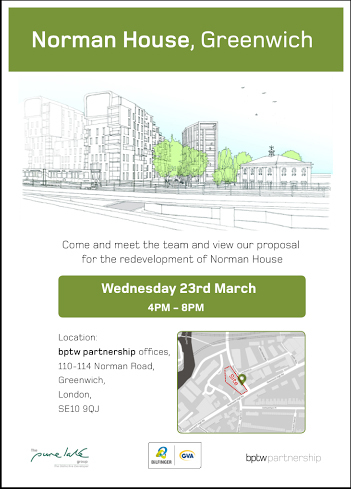 Purelake New Homes with their architects bptw partnership are inviting local residents to view their proposal for the redevelopment of Norman House on Wednesday 23rd March between 4pm and 8pm. This is being held at bptw partnership’s office which is at Norman House, 110-114 Norman Road, SE10 9QJ. Please note that changes to the schedule are possible for reasons beyond the Council's control. If you wish to attend to make a further representation please contact Daniel Wilkinson, Committee Officer on the details below. Once confirmed a link to the Committee papers on the Council’s website will be sent to you along with an invitation to attend the meeting and address the Sub Committee should you wish to do so. If you have not received this the week before the date of the meeting please contact the Officer by email or on the number below. Should you be attending the meeting and require a hard copy of the agenda please let us know in advance. If you have made written representations for consideration by the Sub-Committee, or wish to make one you will need to be aware that a copy of your representation will be included in the committee papers for the meeting and this will be circulated to all parties. If you wish to make a written representation and are unable to attend the hearing it would be beneficial to also copy in our West Greenwich Councillor’s on the email addresses below and ask them to defend the position put forward on your behalf.